Villa SAN is located in the area called PILE, next to the PILE GATE, the western entrance to the Old Town. 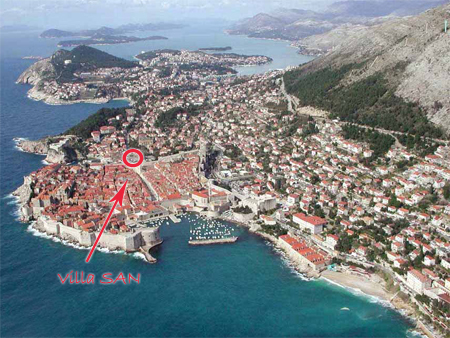 Our house is just 50 meters from the Old City of Dubrovnik and it's famous city walls. Villa SAN is easy to reach from all directions by car/bus/taxi/bike/motrcycle or on foot. Main tourist info center is located just next to our house , only 12m away. Airport transfer is available, please contact us to arrange details. If arriving by airplane, from Dubrovnik Airport, the best way is to book a transfer with us or via airport shuttle which goes all the way to the Old Town and stops in front of our house as a final stop. If arriving from harbour or main bus station, the best way is to take a taxi or buses 1a, 1b or 3 , and go to Pile, the final stop in front of the Old Town. If arriving by car or motorcycle, private parking place is available in our garage. Feel free to contact us for any other questions you might have.